The HCG Diet – What is it? The HCG Diet, which was first described by Dr. A.T. W. Simeons in 1954, is comprised of a very low-calorie diet (500 calories/day) combined with HCG hormone injections over an 8 week period. HCG is human chorionic gonadotropin. It is the hormone that is tested for in pregnancy and is commonly prescribed for infertility. Multiple double-blind studies (1, 2) on the effects of HCG on weight loss have been published since Dr. Simeons wrote his book describing the HCG Diet. All of the studies have the same conclusion. The weight loss that occurs with the HCG Diet is solely because of calorie restrictions and has nothing to do with the HCG hormone. It stands to reason that anyone who restricts their intake to 500 calories/day for an extended period of time is going to lose weight. However, it is the opinion of most bariatric physicians that this caloric intake is not safe. Because no legitimate studies have shown that the HCG hormone to affect weight loss, it is not approved for weight loss by the FDA. Though it is legal for a doctor to prescribe HCG off-label, in most states it is a violation to advertise a drug for an off-label use. In Texas, it is not legal to advertise HCG for weight loss. At Houston Weight Loss and Lipo Centers, we only use FDA approved appetite suppressants, such as phentermine, in our medical weight loss program. Most low-calorie diets prescribed by weight loss specialists have a minimum of 1000 calories/day. Eating a balanced diet of 1000 calories per day gives most persons an adequate amount of the recommended daily allowances of vitamins and nutrients. In certain cases, bariatric physicians recommend below 1000 calories per day. These diets are called very low-calorie diets or VLCD’s. The most common VLCD is 800 calorie per day and is administered with specially formulated shakes. These shakes meet the recommended daily allowances of essential vitamins and nutrients. Trying to meet the recommended daily allowances eating regular food (without using these special shakes) is difficult and usually leaves a patient vitamin and protein deficient. Protein deficiency this can lead to muscle wasting which could lower your BMR and actually make it more difficult to maintain your weight in the future. Furthermore, 500 calories per day is not sustainable. Those who specialize in weight management know that the key to long-term success is permanent diet and lifestyle changes. Changes like always choosing “good carbs” over high glycemic carbs. Or always trying to walk for 30 minutes after dinner. These are sustainable changes one could make in their way of life. No person can implement a 500 calorie per day diet into their lifestyle long term. As mentioned above, even doing this short term is not a good idea. Most clinics that prescribe the HCG Diet tell their patients that they will be able to keep the weight off because HCG “resets your metabolism”. There is absolutely no scientific evidence of this. If this were true, all a person would have to do is come in for their HCG shot on a regular basis and they would lose weight. The truth is if any “resetting” of metabolism is going on, the 500 calorie/day diet is actually lowering the metabolic rate because your body is going into starvation mode. Many patients also are buying “homeopathic HCG” over the internet. These substances have little or no HCG in them and even if they did would have no effect on weight loss. The websites selling these homeopathic HCG hormones are scams. It is not legal to sell any form HCG or HCG hormone stimulator over the counter. 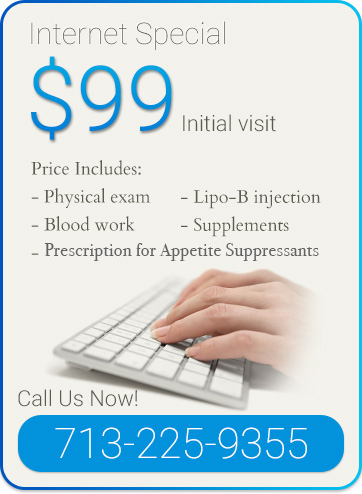 At Houston Weight Loss and Lipo Centers, we use only FDA approved appetite suppressants along with low-calorie diets. Our goal is always to help our patients lose weight safely and lose weight fast. We are also dedicated to teaching our patients permanent lifestyle changes that can be made to help them keep the weight off. Lijesen, GK; Theeuwen, I; Assendelft, WJ; Van Der Wal, G (1995). “The effect of human chorionic gonadotropin (HCG) in the treatment of obesity by means of the Simeons therapy: A criteria-based meta-analysis”. British Journal of Clinical Pharmacology. 40 (3): 237–43. doi:10.1111/j.1365-2125.1995.tb05779.x. PMC 1365103free to read. PMID 8527285.